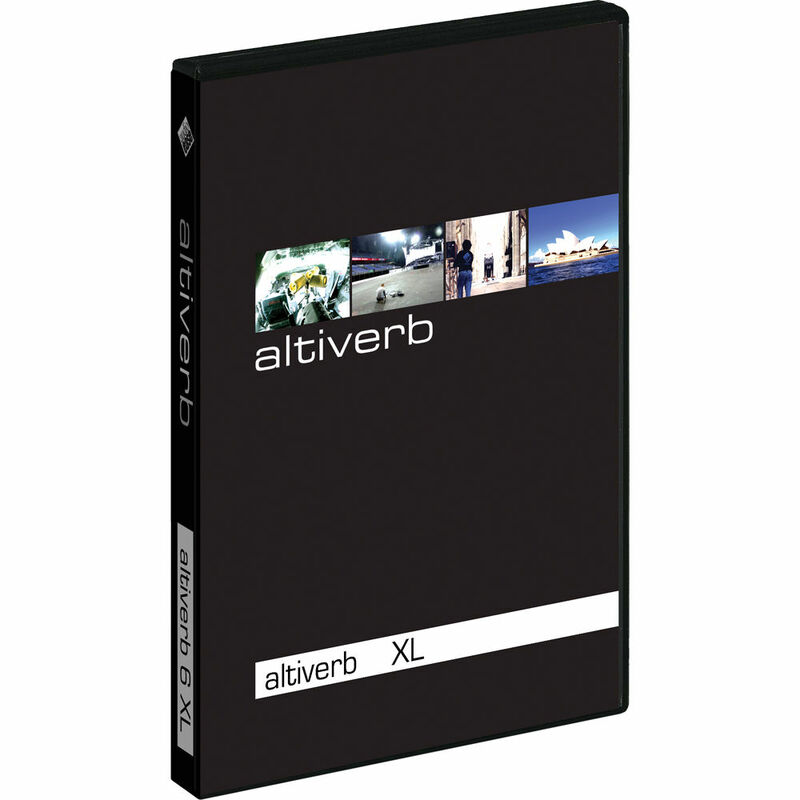 Altiverb 7 XL Software from Audio Ease is a preeminent convolution reverb plug-in that uses top quality samples of real spaces to create reverb, ranging from Sydney Opera House to the cockpit of a jumbo jet. The plug-in is CPU-efficient, offers multiple parameters for tweaking the reverb, has total recall, and features 64-bit support. While Altiverb 7 is a native stereo in/stereo out plug-in with a maximum sampling rate of 96kHz, Altiverb 7 XL adds support for TDM (Mac only), up to 5.1 surround input/output, and sample rates over 96kHz. Altiverb's concert halls and recording studio spaces, including its plate reverbs and digital reverb impulses, are geared mostly towards music production. Adjustments are available for algorithmic brightness, modulation, stage positioning, and tempo locked gated and reverse reverbs. Textures can be achieved by using any sound as an impulse response. Features geared towards audio for picture include surround sound support (up to 5.1), total recall (automation without snapshots), drag and drop impulse response creation, and making of impulse responses using portable radio or even slates (clapperboards). Additional features include extensive and flexible channel setup, and keyword-searching (just type-in "bedroom" or "SUV"). The plug-in's visual browser allows the impulse response library to be more accessible than ever by using photos of the rooms and impulse spaces. Instant gapless loading, organize-by-size, and single-click favorites are just a few of the browser's features, along with single-click downloading and installing of new (free) impulse responses. Note: Requires iLok if one is not already on the system. A powerful keyword search field makes it easy to find items like "metallic resonances," "bed room," "street slap back," or "brick studio"
Times can be set in note values locked to a song's tempo, and there is ten times as much space in the "Stage Positioner"
Available USB port for iLok. Software requires iLok license to operate. Both type 1 and type 2 iLok keys will work. The Altiverb 7 plug-in for Windows has not yet been released. However, Altiverb 6 is included in this package for Windows users. When Altiverb 7 is released for Windows, owners of this license will be able to download a free upgrade from version 6 to version 7. Altiverb 7 XL Software is rated 5.0 out of 5 by 1. Rated 5 out of 5 by Chalupa from Wow! Pricey, but darn it's good! I do mainly classical music and the sampled spaces are just gorgeous.